“Elysium” (2013). Cast: Matt Damon, Jodie Foster, Sharlto Copley, Alice Braga, William Fichtner, Diego Luna, Wagner Moura, Faran Tahir, Brandon Auret, Josh Blacker, Jose Pablo Cantillo, Adrian Holmes, Emma Tremblay, Maxwell Perry Cotton, Valentina Giron, Yolanda Abbud L. Director: Neill Blomkamp. Screenplay: Neill Blomkamp. Web site. Trailer. If you think life is hard now, consider what it’s like in 2154 (at least as depicted in this film). The Earth has become seriously overpopulated and environmentally devastated, overridden with disease, crime, pollution, corruption and cynicism. Control of a perpetually unruly population is managed by brutal robotic droids, highly intrusive surveillance drones and freely dispensed tranquilizers. Even the slightest transgressions, like using sarcasm in addressing authority figures, is treated harshly. It’s such an unimaginably horrible existence that one can’t help but wonder why anyone would want to hang around. Elysium, a giant space station orbiting the Earth, serves as the beautiful – and intentionally segregated – home of the planet’s wealthy and privileged in director Neill Blomkamp’s disturbing new futurist tale, “Elysium.” Photo © 2012 Columbia TriStar Marketing Group Inc., courtesy of Sony Pictures Entertainment. In fact, it’s that very logic that drove the planet’s wealthy and privileged to flee the Earth and resettle on Elysium, an enormous orbital space station, where all of life’s finery has been re-created and where all of the world’s ills, such as poverty and disease, have been virtually obliterated. Of course, to preserve and successfully manage that way of life, Elysium’s leadership has instituted strict measures to keep out the great unwashed masses. Access is seriously restricted, and anyone who attempts to do an end run around Elysium’s elaborate security systems is dealt with severely, thanks to the strong-arm tactics of Defense Secretary Delacourt (Jodie Foster). Some of Delacourt’s measures are so stringent, in fact, that it worries Elysium’s ruling council, including President Patel (Faran Tahir). Nevertheless, despite these concerns, the “threat” of the volatility that might erupt if the two worlds were to cross paths is seen as so great that almost anything is tolerated to maintain order, as well as the self-imposed segregation. However, given these precarious circumstances, it’s only a matter of time before someone from the world below figures out how to successfully dodge the system and infiltrate Elysium’s supposedly impenetrable defenses. 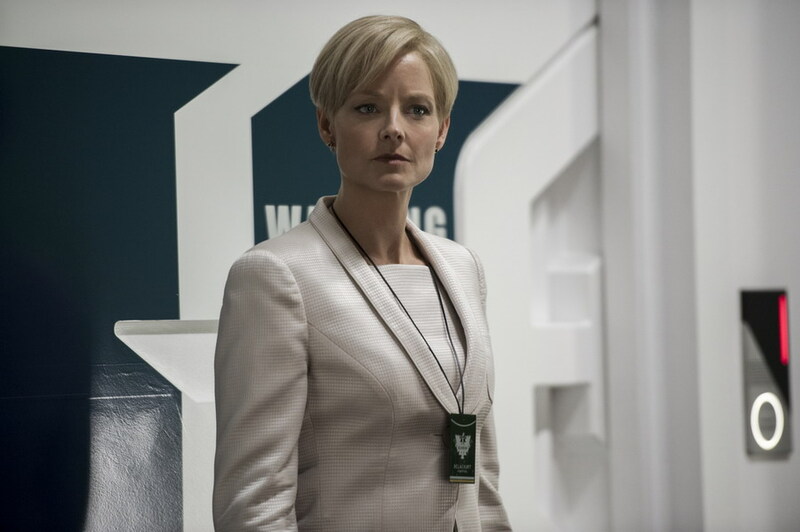 Elysium’s hawkish Defense Secretary Delacourt (Jodie Foster) resorts to whatever tactics are necessary to preserve the privileged way of life on an orbiting space station reserved for the wealthy in the new summer blockbuster, “Elysium.” Photo by Kimberley French, © 2012 Columbia TriStar Marketing Group Inc., courtesy of Sony Pictures Entertainment. That possibility surfaces when Max (Matt Damon), an ex-convict turned factory worker sincerely attempting to go straight, is injured on the job. Having been exposed to a lethal dose of radiation and with only days to live, he’s desperate to get to Elysium to access its regenerative healing technology. He turns to Spider (Wagner Moura), a one-time partner-in-crime whose nefarious activities include the smuggling of unauthorized would-be Elysium émigrés. 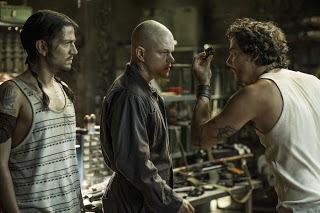 He agrees to help Max in exchange for a favor, namely, obtaining classified computer information – by way of a high-tech direct cerebral download – from a high-profile target, John Carlyle (William Fichtner), one of Elysium’s prominent residents and the owner of the company where Max was injured. With nothing to lose, Max agrees to Spider’s proposal, but, in doing so, he unwittingly unleashes a chain of events with implications far greater than he or anyone else on either world could have envisioned. Before long, a newly armored Max becomes embroiled in a high-stakes conflict centered on possession of the download data, which proves to be far more significant than anyone realized. 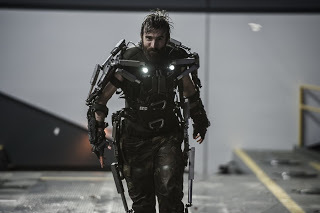 Along the way he does battle with a ruthless mercenary named Kruger (Sharlto Copley) and reconnects his childhood friend Frey (Alice Braga) and her terminally ill daughter (Emma Tremblay), all leading up to a conclusion that has far-reaching ramifications for Elysium and Earth alike. Desperate to access the regenerative healing technology available on a space station reserved for the wealthy and privileged, terminally ill ex-convict Max (Matt Damon, center), aided by his friend Julio (Diego Luna, left), seeks the help of a onetime partner-in-crime, Spider (Wagner Moura, right), in “Elysium.” Photo by Kimberley French, © 2012 Columbia TriStar Marketing Group Inc., courtesy of Sony Pictures Entertainment. When we engage in the practice of conscious creation, we create the reality that surrounds us through the power of our beliefs. Naturally, then, whatever results depends on where we put our focus, for we indeed get what we concentrate upon. And understanding that is crucial to appreciate how the narrative of “Elysium” plays out. For example, the residents of the city in the sky are so preoccupied with preserving the sanctity of their environment against the encroachment of outsiders that they’ll go to almost any lengths to keep them out. Yet, for all their sweeping protective efforts, they’re still routinely besieged by those who audaciously attempt to penetrate Elysium’s defense perimeter (thanks to the smuggling operations of illegal immigration traffickers like Spider). Ironically, though, the Elysians’ obsession with keeping out the unwanted leads to continuing onslaughts by the disenfranchised seeking to gain entry at any cost. Thus, by putting their attention on what they don’t want, the Elysians “unintentionally” end up attracting precisely that. This explains why the conscious creation process is sometimes referred to as the law of attraction, for it operates, with uncanny reliability, to draw to us exactly what we concentrate on, consciously or subconsciously and for better or worse, as a result of the beliefs we put out to the world. This principle is apparent in other ways in the film as well. For instance, from the time Max was a boy (Maxwell Perry Cotton), the young orphan dreamed that he and his childhood pal Frey (Valentine Giron) would one day find themselves on Elysium. Little did he know that the conviction of his beliefs would eventually make that happen (even if he didn’t end up there in quite the way he thought he would). Max’s improbable odyssey thus illustrates how faithfully this process works. If it seems as though there’s an element of “destiny” in this, you’d be right, even if the outcome arises more purposely than serendipitously, with intent playing as much, if not a greater, part than “fate” in such a scenario. That’s because probabilities like this often unfold as a result of the concept of value fulfillment, the conscious creation principle related to living out our lives in line with being our best, truest selves for our own betterment, as well as that of those around us. At first glance, Max might not seem like someone particularly concerned with such a lofty notion as this. 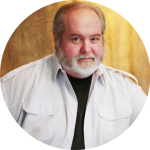 Having lived a difficult life, and despite his recent efforts to improve his circumstances, he nevertheless comes across as someone who readily does whatever it takes to get by. But, no matter what “flaws” he may possess or whatever transgressions he may have committed, at heart he’s a good man, one who’s concerned with issues like fairness and justice. In fact, while he was growing up in the orphanage, a kindly nun (Yolanda Abbud L.) recognized these qualities in Max, telling him that he was destined for accomplishing something great one day. The sister obviously saw the value fulfillment aspect of his character, even if Max didn’t see it for himself at the time (or even much later on for that matter). Yet, despite his lack of conscious recognition of the beliefs that give rise to his value fulfillment, they make their presence felt in the reality he materializes. They serve to manifest an existence in line with their intrinsic nature, indisputably illustrating the inherent power associated with them. 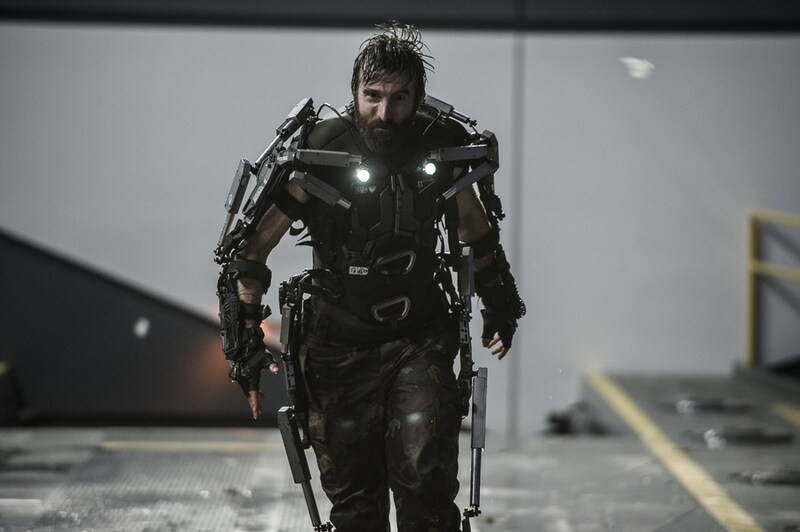 Kruger (Sharlto Copley), a brutal mercenary, is one of the many weapons in the defense arsenal of a space station strictly reserved for the privileged in Neill Blomkamp’s “Elysium.” Photo by Kimberley French, © 2012 Columbia TriStar Marketing Group Inc., courtesy of Sony Pictures Entertainment. Value fulfillment tends to play an integral role where beliefs related to implementing change are involved, and, given the disparate state of affairs on Earth and Elysium, it’s obvious that reform is long overdue.  The challenges involved in evoking meaningful change are indeed daunting under circumstances like these, which, of course, increases the relevance of value fulfillment in bringing new conditions into being. And having someone like Max to champion such a cause significantly boosts the likelihood of seeing an initiative like this ultimately bear fruit. Witnessing the blossoming of such a scenario proves quite inspiring, too, for those both on and off the screen. 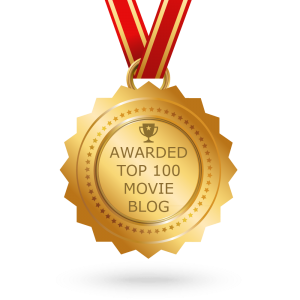 On balance, “Elysium” is a good, though not outstanding, film. Its excellent special effects, well-handled action sequences, capable writing and generally fine performances (except for Foster’s stilted, over-the-top portrayal) make for enjoyable viewing, even if the overall narrative is ultimately fairly predictable as both a cautionary tale and heroic saga. Its sociopolitical and religious/spiritual allusions cover their territory well, despite their sometimes less-than-subtle (if not downright heavy-handed) treatment. Despite these strengths, however, a little more attention to character development (especially in the area of motivations) would have gone a long way toward overcoming the picture’s tendency toward depicting the protagonists as monodimensional archetypes. It’s also a little disconcerting that many of the movie’s attributes recall director Neill Blompkamp’s most recent offering, “District 9” (2009), only with a bigger budget and slightly rearranged plot elements. Given his artistic track record, we now know that the filmmaker is truly adept at probing the kinds of themes common to both pictures, but it would have been eminently more satisfying to see him attempt to stretch a bit more in this latest effort (something I sincerely hope he takes to heart in his next work). The shortage of originality in the overall production can be seen in some of the film’s specific elements, too, such as the art direction, set design and costuming. Again, while these aspects are generally capably handled, they’re also all a little too familiar, reminiscent of such releases as “Blade Runner” (1982), “Total Recall” (2012), “THX 1138” (1971) and the “Mad Max” films (1979, 1981, 1985). Regrettably, as any good cook knows, warming over leftovers may make them tasty, but it doesn’t make them any fresher. As any Bible student or conscious creation practitioner knows, we truly reap what we sow, so it would behoove us to select our seeds carefully. “Elysium” shows us the different kinds of harvests that can result from the belief choices we make and the nurturing we give to them. So, to realize the bounty we seek, we had better tend to our intents carefully – or be prepared to deal with the consequences.